Colonel Tran Minh Son, the former chief of the Sai Gon - Cho Lon - Gia Dinh liberation army commandos during the Anti-American War, says he'll remember the words of his supervisor until the day he dies. "Mai Chi Tho, who was the secretary of the Sai Gon - Gia Dinh City's Party Committee, told me the sound of gunfire had begun in Buon Me Thuot and would end soon in Sai Gon. That was April 25, 1975," he recalls during a recent conversation at his home in HCM City's District 3. "I was very excited, and I believed that Sai Gon would be liberated soon. I trusted his information because I knew he was smart." Son, whose alias was Bay Son during the war, says his underground forces based in the city were told to "pave the way" for liberation combat troops to mount a final offensive and capture the city as part of the Ho Chi Minh Operation. His troops, however, wanted to be part of the final offensive in the city centre, Son says. But Tho said that he had lost too many people on his commando teams, as many of them had died during the Mau Than Tet Offensive in 1968. So, his commandos were ordered to support the other soldiers by completing seven tasks, one of which was to take control of 11 bridges across the city to allow liberation troops to enter the city. They had already been working hard for years, and were battle-hardened. Between February 1974 and April 1975, the commando groups had fought 55 battles in the city's centre and three in the suburbs. Son recalls that two women commandos, Nguyen Trung Kien and Nguyen Thi Thanh Tung, played important roles in the Ho Chi Minh Operation. 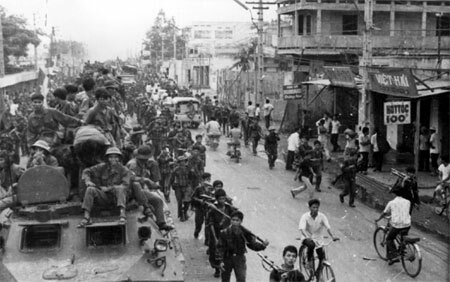 Kien led Regiment 24 toward Tan Son Nhat Airport where it staged an attack, and Tung led a group of local residents who seized the District 9 headquarters of the Sai Gon administration. During those final days, Son's 60 commando groups had three people each. They were dispatched to more than 100 places around the city. Their most important task, Son says, was to support liberation troops preparing to take the city and prevent any enemy obstruction. His commandos were also asked to give directions to the liberation soldiers as they approached the city's outskirts. They were also told to convince Sai Gon soldiers still fighting in some areas of the city to give up their arms. Some of the fiercest fighting, Son says, occurred at Vinh Son Church on April 28. "Their forces had 32 people inside the church shooting at us, while we had only 10 people," Son says. "Two of our commandos were killed. We finally achieved victory after one hour of fighting." "Everyone cried that day, though some of us had not known one another before. We saw soldiers of the enemy take off their military clothes and throw them away with their guns," he says. He also asked 200 students at Su Van Hanh High School to walk around the city to pick up abandoned guns. "From 12pm to 5pm on April 28, they brought me 2,000 guns of all kinds," he says. "No writer can describe the atmosphere at that time. All the people were excited and left their homes to celebrate the victory on April 30." While he was stationed as the leader of the plain-clothes liberation army commandos operating in the city, Son had to be careful about his identity, so he told everyone he was a trader and he sent messages to his troops via secret messengers. Forty years later, following liberation, Col Son, who is now 89, says he is recording his memories in what will eventually be a 100-page book. He is halfway finished. He handwrites his notes, and then Nguyen Trung Hieu, 25, enters the text into a computer for him. "Most of my comrades died in war or recently of illness. 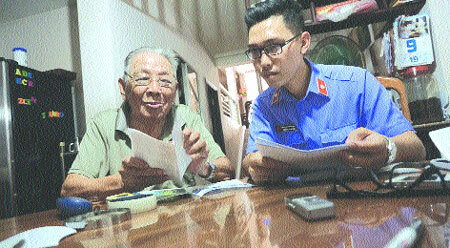 I'm the only leader who is still alive, so I need to tell some stories about the Vietnamese special force for the younger generation," Son says. He says he wants to write the book so that it can be published before April 30, 2015, when the country celebrates the 40th anniversary of Sai Gon's liberation and country's reunification. Son has included information about battles and victories, as well as details about the contributions of his commandos. Some of their remains have not been found, he says. Son's assistant, Hieu, says he knew little about the commandos before working with Son. "But after listening to stories, I admire them. Not many people of younger generations know about them. I think the book is helpful for us. I'm happy to help him write the book," he says. Among the numerous victories, Son says he cannot forget the attack on the US aircraft carrier Card while it was docked at the port of Sai Gon in 1964, the attack on the US Embassy, the Sai Gon Central Police headquarters, and the Caravelle Hotel and others, during the 1960s. Son is especially proud of the damage of the US aircraft carrier Card. The victory shocked the world and President Ho Chi Minh lavished praise on the Vietnamese commandos. Son says his two commandos, operating under the alias Ba Nao and Hai Hung under his supervision, pretended to be traders as they approached Sai Gon Port to put two bombs near the carrier, on which 24 helicopters were parked. When asked why he wanted to write the book, Son again speaks fondly of his fallen comrades.